Now everyone was very nervous, any time there was lightning and anytime we had to go anywhere out of the secured Panama Canal Yacht Club grounds. Gigi recovered well with no complications. We had negotiated a good month rate with Yacht Club so Roi Soleil and Ednbal ended up next to each other, bows tied to the concrete breakwater and sterns to moorings behind with a bulk carrier wharf about 100m further behind on the other side of this area of the Colon harbour. All is usually quite peaceful until a bulk carrier berths or leaves from the wharf behind us. Mostly the ships petrochemical carriers that seem to load and unload falling or rising, which ever the case may be, many metres. In the early hours of one morning a tug was pushing the bow of a ship almost immediately behind us. The wash from the tug's huge propellers pushed sideways with such force that Roi Soleil's stern line to its mooring broke. Fortunately Lulu had another line tied to a larger power vessel next to him and Roi Soleil's keel hit the bottom to stop her from being forced into the concrete breakwater. I was helping. Gigi and Lulu when Sasha yelled to me that Ednbal was about to ram the vessel on the other side of us. She tried to stop Ednbal but only succeeded in bruising her arm. Luckily we had another line tied and were able to get a fender between the two boats, no other damage done. After the tug and carried had moved out Lulu and I then paddled a dinghy out to the mooring buoy and tied a new, heavier line from Roi Soleil to the stern mooring. An hour or so later we were all tucked up in bed again!! When we initially arrived in Colon we were able to get only a one month visa. Now it was time to get an extension, maximum 2 months. On 1 August 2007, one day short of our first one month, the 4 of us caught a taxi to the immigration office to apply for our extension. The four of us caught a taxi to the immigration office, in not such a good part, not there are too many good parts, of Colon. We were quite tentative getting out of the taxi and walked quickly, as fast as Gigi could as her knee was still swollen and sore, the two buildings to the entry of the immigration office up one flight of stairs. The office is something out of about the 1950s, not that I can remember back that far of course, each of the 3 “clerks” each had a glass window looking out into the waiting room that had about 20 seats in 3 rows, old metal ones bolted together and to the floor. At the bottom of the 1 meter high glass window was a small cut out to pass documents through but the top was completely open. Along the wall were old metal filing cabinets, the ones made from what looked like plate steel with big old key locks and substantial handles. Inside the office were old wooden desks with chips taken out and severely “discoloured”. Old type writers, not a computer in sight. We spoke to one of the clerks, Lulu in his best French, English, and Spanish attempting to get across that we wanted an extension of our visas. It soon became apparent that there was a problem, seems the camera used to take the passport style photos for our extension cards was broken. You have to go to Panama City to get your extension we were informed. “No way”!! A guy who had been in and out of the office came over to us to help interpret as he spoke good English. After Lulu explained that Gigi was still recovering from the street attack and that he would phone the Swiss ambassador if things were not sorted out we eventually got an audience with the big boss and the “interpreter”. The outcome was a temporary visa and we should return on Tuesday to get our photos and I'd cards. We said we wanted a taxi, the “interpreter” said he could take us, turns out he was just a taxi driver who happened to be in the office, we all thought he was one of the important immigration officers! On Tuesday we returned, immediately the clerk we had seen last time was all smiles, obviously the camera was fixed. 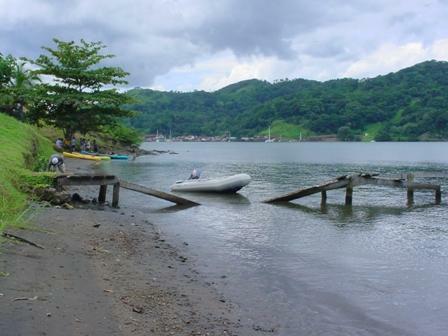 In due course of time all the gear we had ordered arrived and our one month, paid up front, stay at the dock of the Panama Canal Yacht Club was nearing an end. On Monday August 13 we did a big boat clean. The bottom was covered in barnacles, the decks almost covered in mould, in places green. On the shore to the East, opposite Ednbal, there was a huge tree which meant, even if the sun did come out, for half the day we were in shade anyway, great for the mould. In the afternoon we pulled out, refuelled and anchored in the Flats ready for a morning start for a short trip to Portobello about 20 miles. 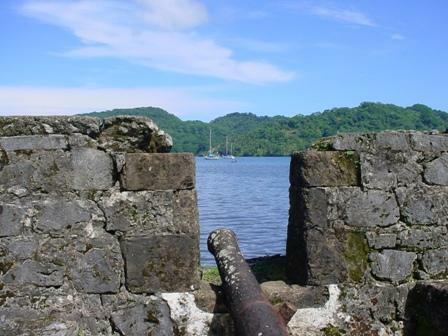 After weaving in and out of the ships anchored in the Panama Canal anchorage we were out through the South Eastern sea wall entry to the Caribbean Sea, sailing again at last. Without having tuned the navigation instruments, autopilot in particular, things were a bit erratic. The wind direction was out by at least 30 degrees and the autopilot compass heading by almost 60 degrees. We found later, while tuning in Portobello that the fluxgate compass had been affected so we installed a new one. In addition the log (gives the vessel speed through the water as opposed to the speed over ground given by the GPS) was not working. Seems the paddle wheel log transducer was another casualty of the lightning. Without it you cannot measure “set” and “drift”, the effects of currents on the vessel. By now we have a pretty good feel for such things so real big deal, we'll get a new log transducer at some stage. Sailed most of the way to Portobello and dropped anchor not far from Lulu and Gigi aboard Roi Soleil. Portobello is a village of a couple of hundred, it was the major port of the coast under control of the Spanish a couple centuries ago. 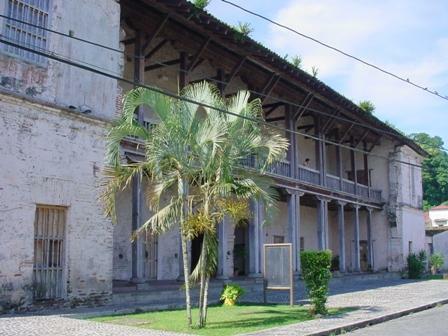 The town square, some large buildings and forts are remnants of the era. 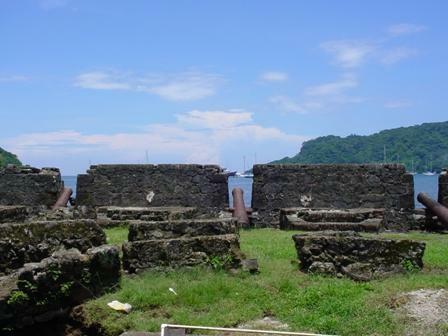 There are 3 forts, although nothing re built or renovated, there were in remarkable condition, still with original cannons lined up and pointing out into the bay. Editor's note: We lost the camera in Cartagena with all the photos taken in this period. The following photos are taken by Gigi, so unfortunatley do not reflect activities described in this Roger's journal. 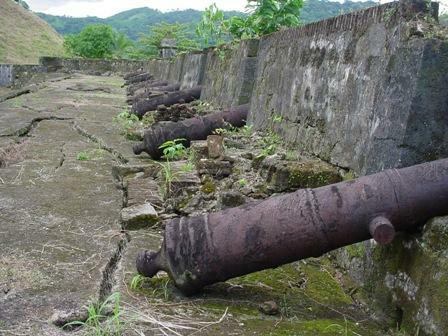 Unfortunately there are no cannon trolleys, all the wood and wheels from those were used or burnt by the locals long ago. Our bicycles had been stored in the spare head on Ednbal since leaving the USA, here we may get a chance to use them. After retrieving them, ferrying them ashore on the dinghy and assembling them we set off of a ride to the Rey supermarket, according to the navigator, “just around the corner”. Three and a half hours, 2 inches of rain, 10 hills and half a dozen near misses by overtaking vehicles later, two sodden bike riders arrived at the Rey supermarket almost 30km away. There was no way we were going to ride back again, we could barely walk, let alone ride. 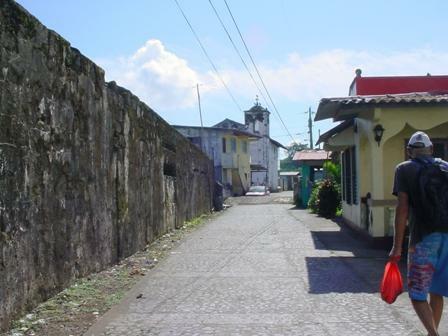 The area looked distinctly dodgy and, after the attack episode in Colon, we were not keen to hang around. We managed to find a taxi with tray on the back, a 4 door cab chassis, bundled the bikes in the back and for $15 got back to Portobello where the bike went on the market. When we left they stayed with Lulu and Gigi's friends, Collette and Michel, and for sale signs in various places. There is a bus service from Portobello to Colon and you can get off half way to catch the connection to Panama City. On different days we did both. The buses are old disguards, mostly from Miami, generally old school buses. Some still have the stop signs the swing out from the side. All are repainted and look reasonably neat from the outside but inside and mechanically, that is another question. The first one we caught had most of the seat stuffing hanging out from the seat backs and had a terrible vibration from what felt like a horribly out of balance back wheel. That did not stop the driver doing almost 100kph down the hills on the narrow two lane road. The second one was much the same except there was a terrible grinding sound when ever the brakes were applied. Never the less we survived, to and from our destinations.